Liverpool Telescope (left) and impression of New Robotic Telescope (right). Liverpool John Moores University (LJMU) owns and operates the 2.0 metre fully autonomous Liverpool Telescope on La Palma in the Canary Islands. 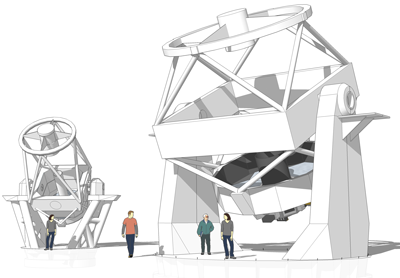 Working with international partners we now intend to build a 4.0 metre class robotic telescope on the same site. We are seeking experienced personnel to fill two 5-year fixed-term positions of Project Manager (Vacancy Ref. 2045) and Lead Engineer (Vacancy Ref. 2046). Salary for both posts will be in the range £39,993 – £49,149 per annum. The Project Manager will take responsibility for managing cost, quality, risk and schedule in the delivery of the telescope and its enclosure. They will organize and monitor the delivery of effort within LJMU and in external partners and companies as well as establishing and maintaining systems of document management, change control and interface control. They will also take responsibility for integrating project delivery within existing LJMU processes and systems in areas of governance, finance, procurement and legal and manage contractual relationships with partner and supplier organisations. The Lead Engineer will lead all engineering activity related to the development of the telescope and its enclosure. They will identify and manage the delivery of effort within the LJMU engineering team, external partners and companies as well as carrying out System Engineering responsibilities and contributing their own discipline-specific expertise to the design. They will also take ownership of the Health and Safety aspects of the project. For both posts the closing date for applications will be midnight at the end of Friday 3rd November 2017.